Thanks for clicking! Well, if you are reading this post, you are interested in the work of the Lou Frey Institute and wondering how you might be able to help. On this #GivingTuesday, please consider donating to the Lou Frey Institute so that we can continue our work in civic education. So who are we, and why should you consider donating to our efforts? The Lou Frey Institute is housed at the University of Central Florida. As you can probably surmise from the infographic above, the Institute serves as the umbrella organization for a number of civics-oriented projects with both state and national reach. Professional Development: focus on classroom teachers at all experience levels covering virtually any content area or pedagogy relevant to K-12 civics. To access FJCC materials please visit http://floridacitizen.org/. 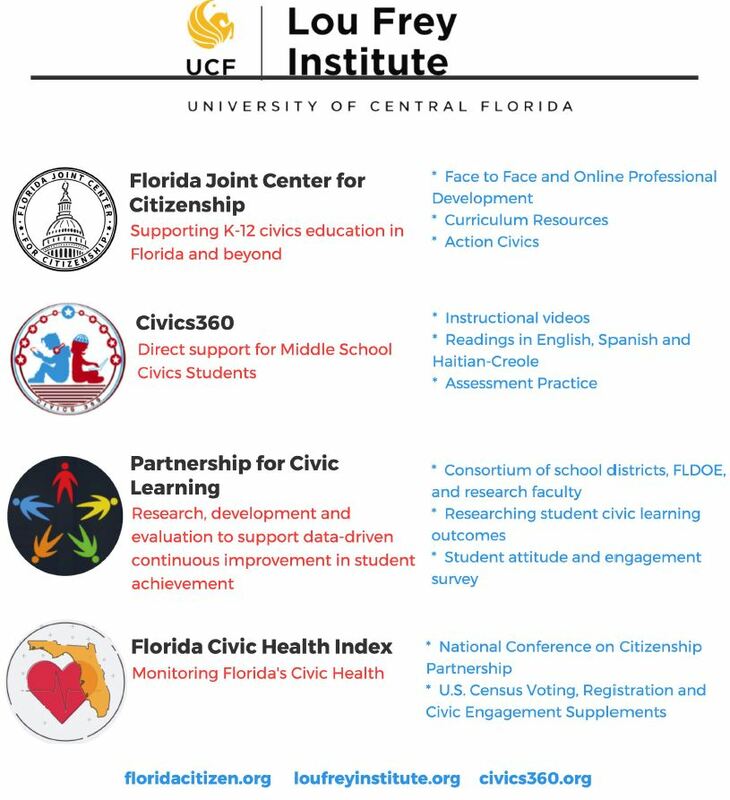 Civics360 is an interactive civics review tool to help Florida students improve their understanding of civics. This resource was create in partnership with Escambia County School District, and targets the civic knowledge and skills necessary to succeed not only on Florida’s Civics End of Course Assessment, but as knowledgeable and engaged citizens. Resources available on Civics360 include student friendly animated videos around specific content areas, related readings (in English, Spanish, and Haitian Creole) written at a 7th grade level, assessment practice, and vocabulary tools, among others. To access Civics360 materials please visit http://civics360.org/. The Partnership is composed of school district curriculum specialists selected by the Florida Association of Social Studies Supervisors, assessment and curriculum specialists from the Florida Department of Education, and educational research faculty from the University of Florida, Florida State University, the University of South Florida, the University of Central Florida and Tufts University. The Partnership is open to others in interest and expertise in civic education. The Partnership's mission is to conduct research, development and program evaluations to support data-driven continuous improvement process in civic education. The PCL's research and development priorities are developed and approved on an annual basis by the membership. The scope of the Partnership's work may include, but is not limited to, monitoring and studying outcomes of statewide civics testing, the development and testing the effectiveness of K-12 civics curricular materials, testing instructional pedagogies and understanding the effectiveness of professional development. The PCL provides a continuing assessment of factors affecting the implementation of Florida's Justice Sandra Day O'Connor Civics Education Act and may provide technical assistance to districts upon request to support successful implementation of the Act. You can learn more about the partnership by visiting http://loufreyinstitute.org/pages/partnership-for-civic-learning. Participation in civic life is at the heart of democratic governance and vibrant, healthy communities. This site is your tool to monitor civic participation in not just Florida and its communities, but other states as well. To help you better understand civic health, the site allows you to compare across states and cities across the nation. Our goal is to support your efforts to improve both Florida's civic health and that of the nation. Data provided on this site are from the Current Population Survey (CPS), a monthly survey of about 60,000 households conducted by the U.S. Census Bureau. The CPS annually administers three supplement surveys related to civic engagement and civic health; the Voting Supplement, Volunteering Supplement, and Civic Engagement Supplement. The supplements gather data on the civic activities of individuals age 18 and over and on the volunteering activities of individuals age 16 and older. Civic activities reported here include membership in civic organizations, donating to charitable organizations, boycotting or buying a product for social/political reasons, attending public meetings, contacting public officials, working with neighbors to fix a community problem and volunteering. Data from the Voting Supplement shows the percentage of individuals who voted in the last election and the percentage of individuals who did not vote, but were registered to vote. To take a look at the civic health of your state and community, visit the site at http://floridacivichealth.org/. So that is just a taste of what we do. We hope to be able to continue our work both in Florida and nationally, and your tax-deductible donation can help us in our efforts. Thank you for considering us as a possibility on this #GivingTuesday, and for being an engaged and active citizen!